Take the boredom out of winter training and hit the roads this Spring super-fit! 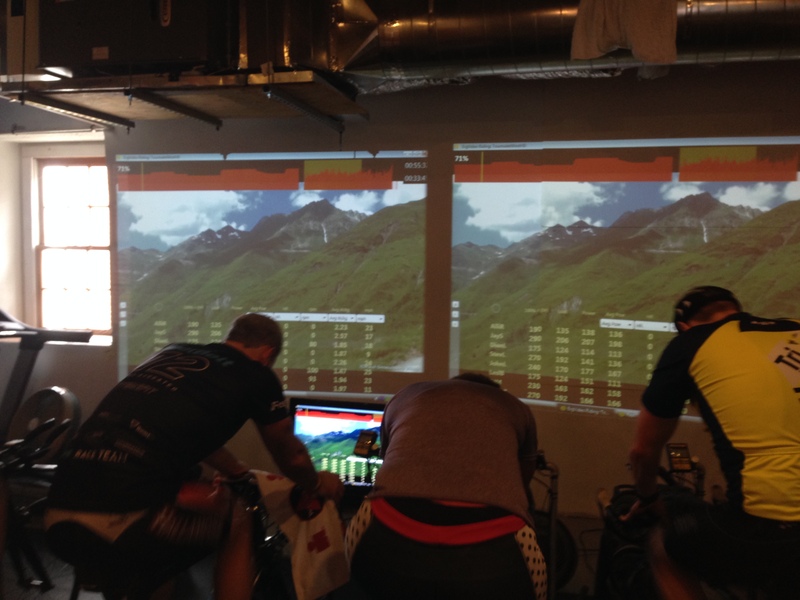 TriFitLab features a state of the art 11-man indoor cycling studio equipped with Computrainers, Ergvideos, and TWO massive projection screens measuring 8′ x 15′ for true Video Reality Cycling! ErgVideo: the simple story from Paul Smeulders on Vimeo. 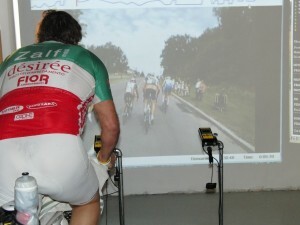 This is just a sample of what you’ll see on our giant screens – say goodbye to boredom and wasted training time! Workouts are power-based – you enter your individual threshold power, and what percentage of that power you want to base the workout on. From there the Ergvideo takes over and you MUST generate the power it requires – no slacking allowed! But don’t worry – you can change your power setting on the fly. Each video puts you into a different ride – criteriums, team time trials, scenic base rides, famous Tour climbs, motorpacing, etc. Everyone who buys a pass can also participate in a free 20 min threshold power test – a great way to track your fitness. 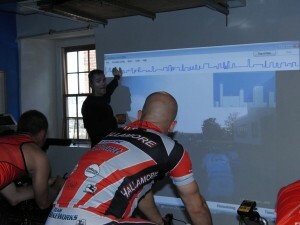 We save your personal data from all workouts sessions – heart rate, power output, cadence, etc. so you can see your progress. 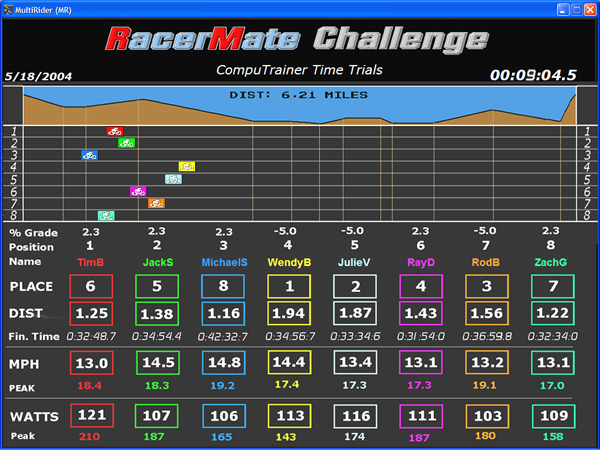 We also offer indoor time trial racing and road racing via the Computrainer Multirider software. 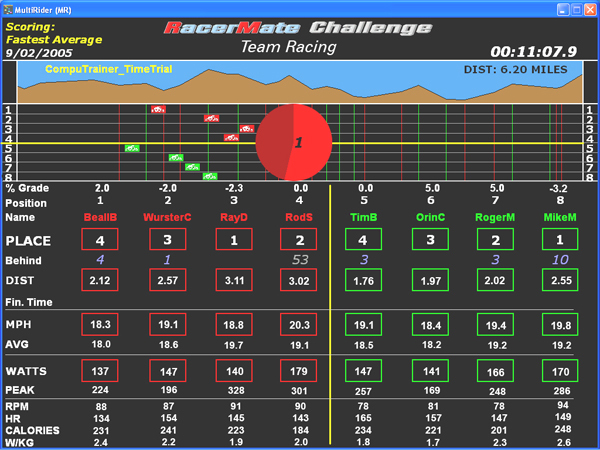 We can even stage races between 4-man teams complete with drafting! Stay tuned for the dates of these events! Finally, we also have Real Course Videos of famous courses like Kona and St. Croix. These are terrain-based workouts that you can ride as hard as you like. We will offer several sessions a week, and each will require advance signup via our signup page to reserve your spot for a particular session. If you are a member of a team and would like to reserve a set weekly time for a team workout, please contact us. Check out the Multirider signup page to see who has signed up for what session and if there are slots left. The multirider system requires you to bring your own bike. We will offer FREE bike storage as long as space permits for anyone buying passes. We have a treadmill too if you really want to do a brick! And yes, even a Vasa swim trainer is available for a quick swim workout. 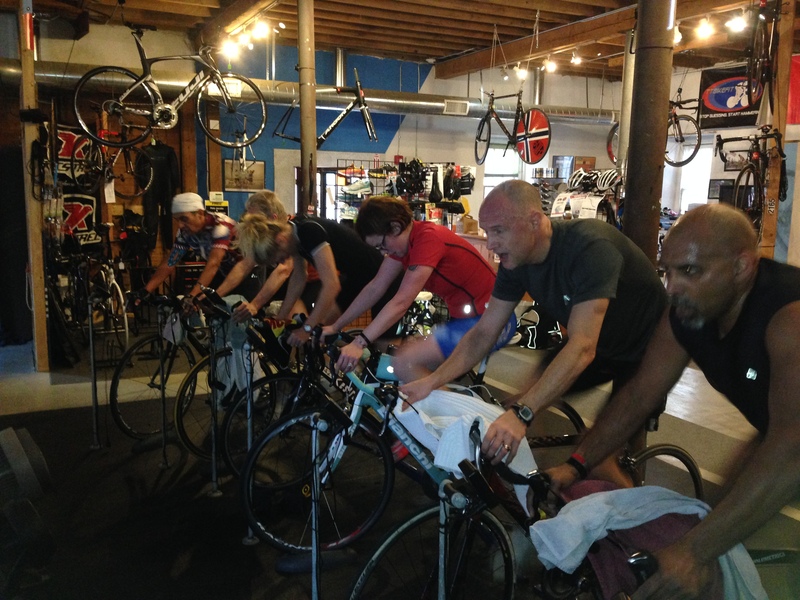 Weekday sessions will last approximately 60-75 mins, of which about 45 mins will be tough stuff. Weekend sessions will last approximately 2 hours (sometimes 2.5) and typically will be lower intensity. If you have a pass, we will also allow you to come in anytime we are here and ride outside of normal sessions. Please email us to schedule a time. $159.95 for 10 rides – note that weekend 2 hour rides count as 1.5 rides!! For more info please call or email , and watch this site for updates!